Have you ever checked Order Grid of Magento 2 websites and found numerous unwanted orders, for example: closed, canceled or test orders, making the order list messy and hard to manage? However, Magento 2 doesn’t have the delete order function. To delete those redundant orders, you have no choice but to change your database or write new scripts. Now, we provide you with Magento 2 Delete Order extension – another safe and easy solution to remove single or multiple undesired orders as well as related documents (invoices, credit memos, and shipment documents) within clicks. 1.1 Does The Default Support Magento 2 Delete Order Feature? 1.3 How Can Magento 2 Delete Order Extension Benefit You? Our Magento 2 Delete Order extension is designed with easily configured features to help admins clear junk orders without much effort. Just by some clicks on the unwanted orders, admins can get rid of them permanently from Magento 2 backend with all linked documents including credit memos, shipments, and invoices. Moreover, if admins remove invoices/shipments/credit memos, then the order status will be automatically updated. Does The Default Support Magento 2 Delete Order Feature? Currently, Magento 2 default is not equipped with delete order functions so admins can only mark unnecessary orders as Cancelled or Closed. It means they remain in the grid and may result in inconvenient management, especially for the stores dealing with bulk orders per day. As mentioned above, admins can only clear out the orders by modifying databases or core files. Let’s make it easy and time-saving with our Magento 2 Delete Order extension, coming with features as follow. Permanently delete selected orders and their associated documents (invoices, credit memos, shipments) permanently at one time. Effortlessly clear unwanted invoices/credit memos/shipments. Automatically update order status after removing invoices/credit memos/shipments. 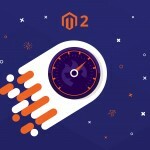 How Can Magento 2 Delete Order Extension Benefit You? 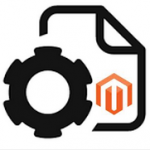 Delete Order for Magento 2 extension is useful to save time and effort in order management. By default, you can only turn their order status into Cancelled or Closed without complete removal. With the use of Magento 2 Delete Order extension, admins can delete as many orders as needed to make a neater order grid. Once installing Magento 2 Delete Order extension, admins can make use of its wonderful features to remove orders/invoices/credit memos/shipments as needed. 1. Let’s begin with Delete Orders function by following Sales ⇒ Orders. Here you see a Magento 2 order grid listing all types of orders in which you can select single or bulk orders to be removed. Note that, all removed orders are not able to restore, so you should be careful. After ticking on orders and performing “Delete Orders” action, a popup is displayed to confirm admins’ order removal decision. Click on “OK” and the chosen orders are completely wiped out, together with the related documents consisting of invoices, shipments, and credit memos. 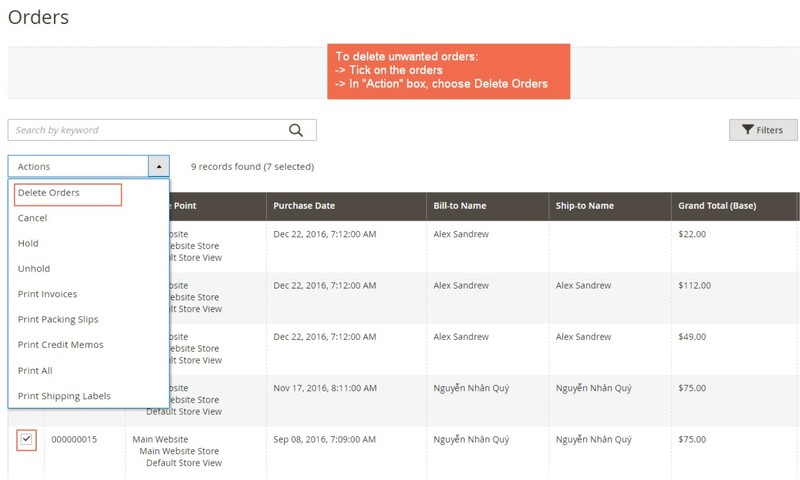 You can also delete a specific order right on its Order View Page with the Delete button. 2. Regarding Delete Invoices, our Magento 2 Delete Order extension also provides two easy ways. Firstly, reach Sales ⇒ Invoices, tick on invoices that need removing, choose “Delete Invoices” in Action box and “OK” on the success popup. Besides, you can remove single invoice by clicking on “View” to go to Invoices tab of Order View Page and choosing Delete button or Delete Invoices in Actions box. Once invoices are removed, the status of related orders will be updated to Pending (in case the deliveries have not been performed yet) or Processing (in case the deliveries have already performed). Accordingly, the associated credit memos are deleted, and you can recreate other invoices later. 3. Similarly, Delete Shipment feature can also be applied right on Shipment Grid in Magento 2 Admin Panel. Or on Shipments tab of Order View Page as follow. If the invoices related to removed shipments have not been created, then the order status will be turned into Pending; otherwise, they will be updated to Processing. The shipments can be recreated later. 4. You can carry out the same process when it comes to Delete Credit Memos. Go to Sales ⇒ Credit Memos, select credit memos, and remove by clicking on “Delete Credit Memos” of Action box and “OK” on the notification popup. Another choice to erase credit memos is to delete on Credit Memos tab of Order View Page. The auto-update feature of Magento 2 Delete Order extension is also applied to orders related to the removed credit memos. If admins have already created the shipments and invoices, then the order status will be changed to Complete. If there are only invoices to be created, the status of orders will be updated to Processing. Admins can easily recreate credit memos as needed. 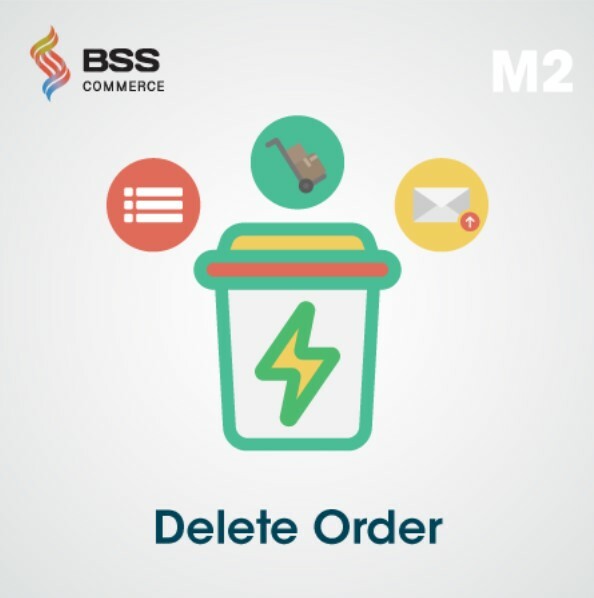 Our Magento 2 Delete Order extension meets your requirement to remove undesired orders. Check now to wipe out undesired orders, invoices, shipments, or credit memos in one click. This time-saving module is available for both Magento 2 CE and EE at a reasonable price with Free installation, Free Upgrade, and Free 1-year support.